Pine Siskins ~ Cardinal watching the action! But - this class was all about creating bird-feeders and I came up with a few originals and I experimented with several I found on the Internet. As far as I know this DIY is an original, but I've came to the conclusion that there really isn't a novel idea anymore. 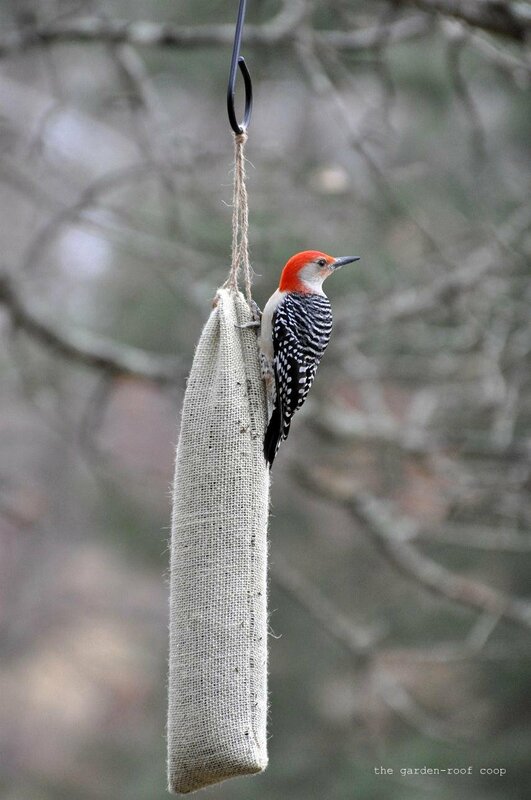 Even if you think that you thought of something first - you probably didn't... Really the best thistle feeder is a purchased tube feeder that is specifically designed to hold this small seed and prevent waste. 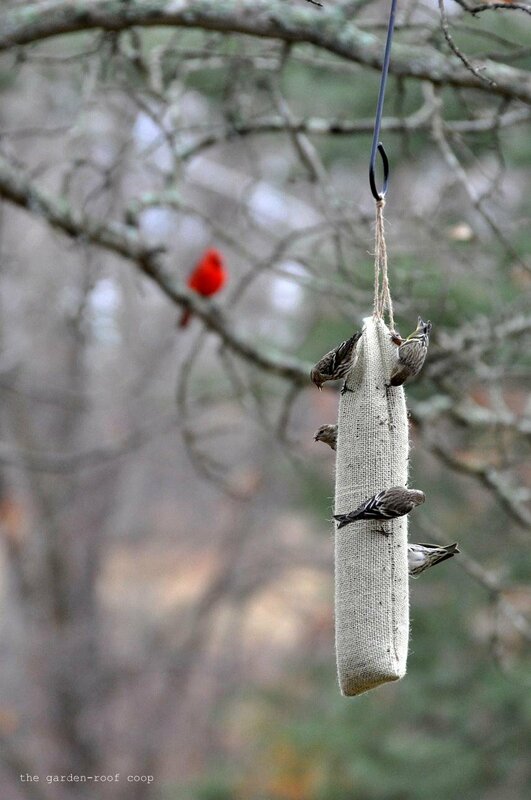 When I tried to come up with a DIY way to offer thistle, a sock feeder seemed like the logical option. The examples that I found didn't seem that durable and were rather unattractive, such as a DIY thistle sock made out of recycled or repurposed pantyhose... Another tutorial used the mesh lining out of old running shorts. Neither of these examples sounded as if they would hold up very long or actually work. I decided to construct my own version of a thistle sock using burlap because - it's cheap, the weave is small enough that the seed won't fall out and it's more attractive than watching the birds eat from an old pantyhose :) I'm not sure how long this sock will last... So far it's been re-filled three times and hasn't shown any signs of damage. And - at less than 50 cents a feeder, I think it's a pretty cheap way to offer thistle to my backyard birds - if only the thistle or Nyjer seed wasn't so expensive! Cut out a rectangle about 8 x 15"
Fold the rectangle in half lengthwise and sew the sides and one end using a 5/8" seam allowance. 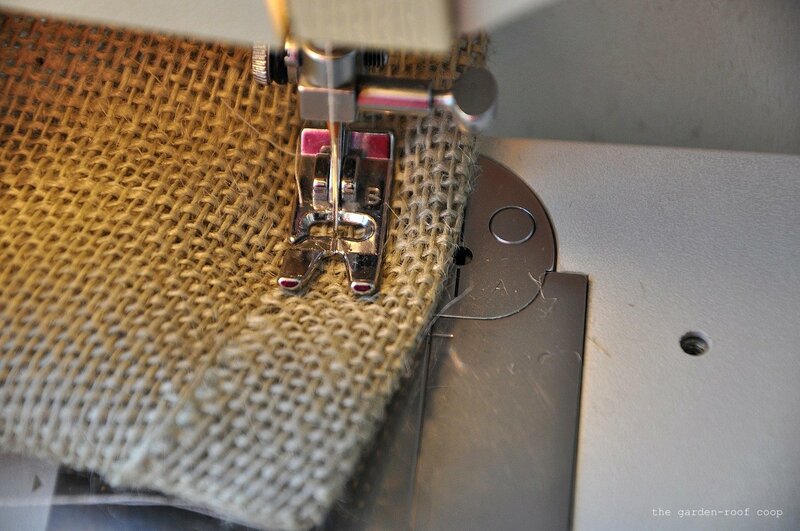 Double stitch the seam by sewing another seam 1/4" from the edge. 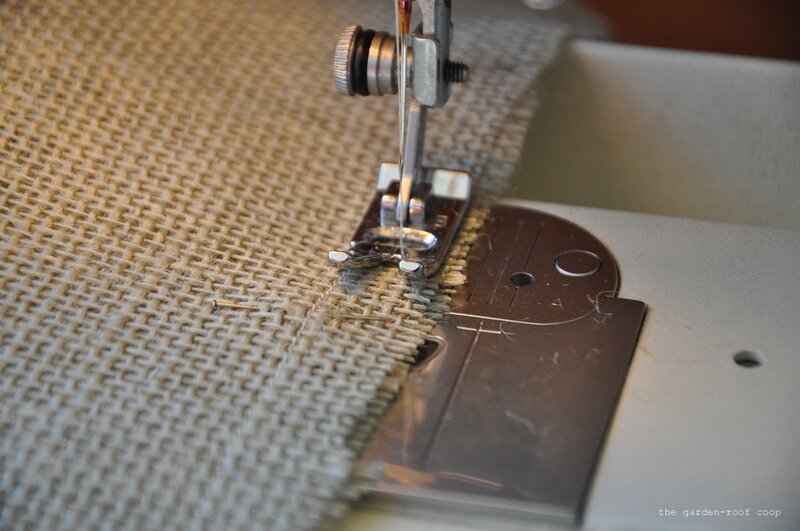 In my first version, I noticed that the birds found the seeds easiest to pick from the seam - double stitching the seam will definitely increase the durability of the sock! Turn under the top edge of the sock (right sides together) 3/4" and stitch 1/4" from the edge. Turn the sock right side out. 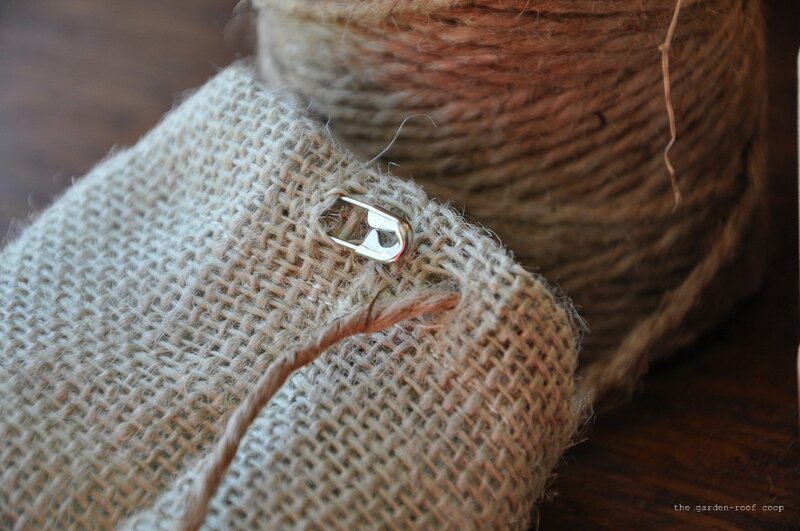 Using a safety pin attached to 1 yard of jute, make a small hole in the folded edge and thread the jute through the fold. 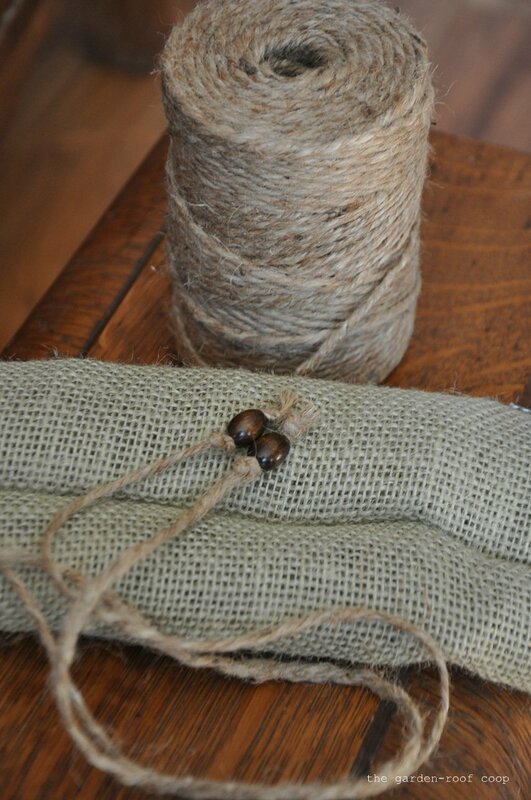 I added a couple of wooden beads to the ends of the jute and secured them with a knot above and below the bead. Add thistle to the sock (a funnel works well), pull the jute tight and tie. 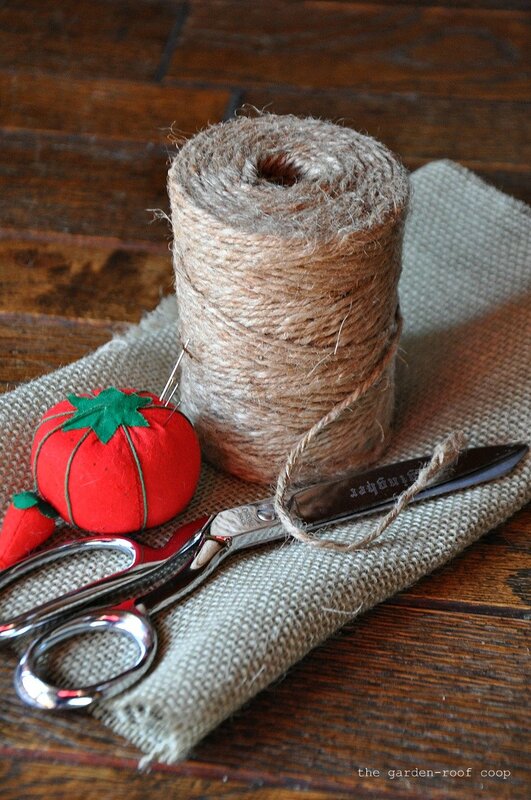 Make the jute strands into a slip knot to hang. Not at all interested in thistle... Just a resting spot! I love your blog. This is such a great idea. I will be trying it out. Thanks so much for posting the directions. Very cool idea! 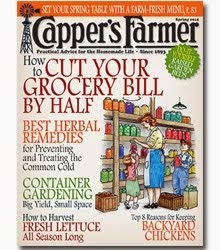 I need to go through my fabric stash to see if I have any burlap. Great idea for a thistle feeder. 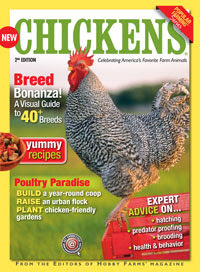 Love the birds, especially the woodie! This is very cool! Maybe I will try it. 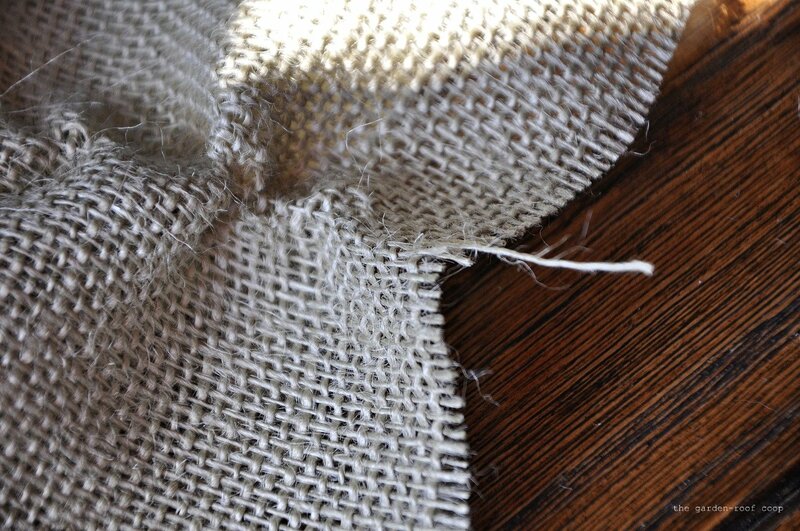 I have to find out if my sewing machine still works and buy some burlap. But I really do like the idea of making a bird feeder. 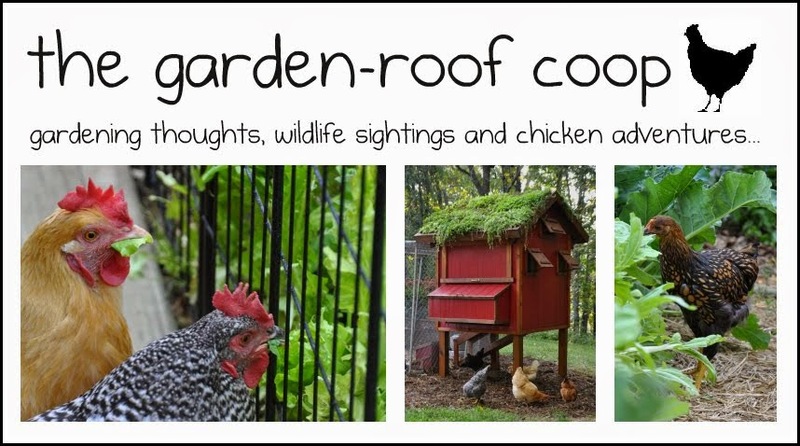 I love this idea and so will the birds......Thank you for sharing with the Clever Chicks Blog Hop this week; I hope you’ll join us again! I like this idea also but my issue would be the squirrels, wondering if they would tear this up? I love feeding the birds but seems to bring the squirrels around, which starts a mess. I don't know how long the jute will hold up, but I repaired my heavy sock feeder, with a shoe string after the cord wore thru, and it held up a very long time. I think it even outlasted the feeder. Excellent information. 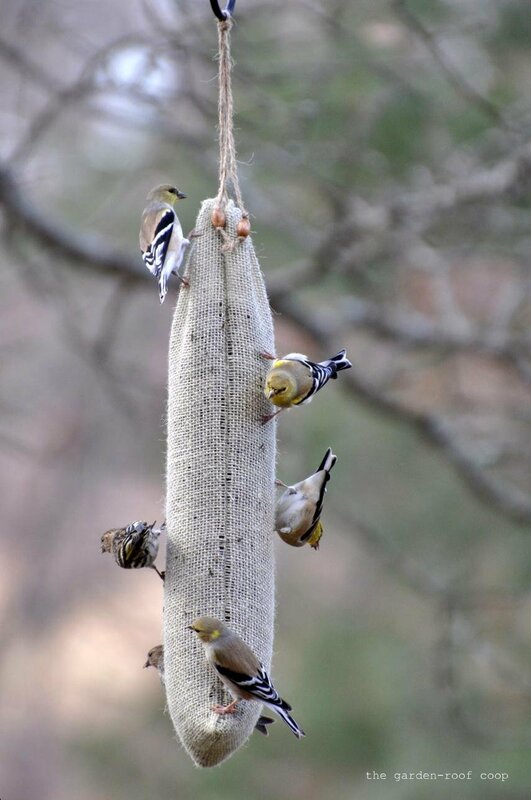 I have been feeding yellow finches and all other birds for years in NC using the small hole laundry bags made into feeders. Over the past 20 years the holes in the newer mesh bags have bigger holes and not as functional. I always made mine just like you have done but the material is scarce now and my last few have only lasted for this spring/summer season. Previously I made them for family but more recently I have kept the feeders just for us to enjoy using. Maybe now I can get back to making them for others Thank you so much for sharing with others. 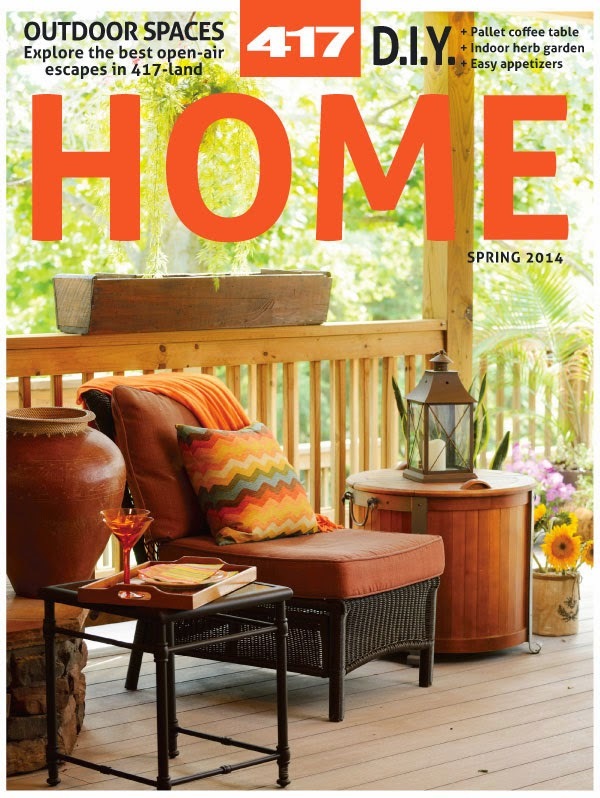 I am so glad to have run across your article.